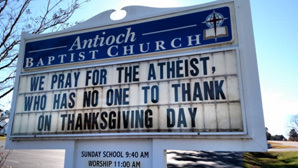 "We pray for the atheist, who has no one to thank on Thanksgiving Day." 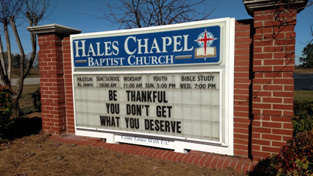 "Be thankful you don't get what you deserve." Recent Research shows that atheism is rapidly growing and gaining respectability in America. Practical atheism, however, flourishes more than ever. Practical Atheists don't necessarily deny God's existence; they just live as though there is no God. In a recent article, Arthur Milikh, assistant director of the B. Kenneth Simon Center for Principles and Politics at The Heritage Foundation, argues that avoiding the many pitfalls of a national self-satisfaction and pride was partly behind Washington and Lincoln's Thanksgiving Day Proclamations. "In the present time it has become fashionable to espouse if not open atheism, then at least antagonism toward religion. These opinions come forth in various, sometimes obfuscated, forms. "Part of the left's recent fanaticism originates from the fact that progressivism's quasi-religion lacks any understanding of gratitude and humility. Progressivism precludes belief in these since progress as an alleged cosmic force is neither merciful nor beneficent but is merely abstract and all-powerful. As such, it does not encourage its believers toward humility or gratitude. "Neither does belief in the abstract, and inhuman forces of progress require humility on account of human frailty and ignorance. Rather, progress, claiming perfect knowledge of the laws of the universe, leads to fanaticism. "Is the individual, modeled on these assumptions, of the kind required for self-government? Rather, does not self-government require generosity between citizens, which can be the product only of a common recognition of an America inhabited by one people, united in a common cause, with common beliefs, grateful for what has come before us? Is this not the end of our nation's current practical atheism? Could Lincoln's words be any more pertinent to our times? The apostle Paul warned in the book of Romans about the sad results of a nation's ingratitude. He wrote, "Because that when they knew God, they glorified him not as God, neither were thankful; but became vain [empty, or foolish] in their imaginations, and their foolish heart was darkened." The apostle continues, saying, "For this cause God gave them up unto vile affections." And then he adds, "And even as they did not retain God in their knowledge, God gave them over to a reprobate mind" – meaning a disposition or attitude of life incapable of good. America's greatest problems today can be traced directly back to the lunacy of its thankless, self-satisfied and self-congratulatory practical atheism. Perhaps this Thanksgiving we would do well to be thankful that we haven't yet received what we deserve – God's final, full, and irrevocable wrath. Sproul, R.C. "What Is Practical Atheism." Ligonier Ministries. N.p., 12 Jan. 2015. Web. 25 Nov. 2015. Milikh, Arthur. "Why George Washington Thought the Practice of Gratitude Was Essential for the American Character." The Daily Signal. N.p., 24 Nov. 2015. Web. 25 Nov. 2015. Peters, Gerhard, and John T. Woolley. 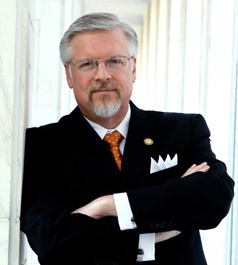 "Proclamation 97 – Appointing a Day of National Humiliation, Fasting, and Prayer." The American Presidency Project. N.p., n.d. Web. 25 Nov. 2015.